Like The Day the Earth Stood Still, Advise & Consent is one of those rare films whose themes never seem to age. Even its plot has held up remarkably well. When I watched it a few years ago, President George W. Bush was encountering opposition from the Senate—and his own party—on the appointment of Robert Bolton as United Nations ambassador. In Advise & Consent, the President (his name is never given) clashes with the Senate and his own party on his nomination of a liberal academic to become Secretary of State. Fonda as the President's pick. His nominee Robert Leffingwell (Henry Fonda) isn’t even sure he wants the job at first. But the President (Franchot Tone), whose ailing health threatens the future of his policies, remains steadfast in his choice. Even a potentially scandalous secret from Leffington’s past can’t convince the Commander in Chief to alter his position. The President’s unyielding stance sets into motion a political chess match in which Senators take sides and people become pawns. (The chess analogy is an interesting one: Walter Pidgeon, who fights for Leffingwell, wears a dark suit; Charles Laughton, who opposes him, wears white). 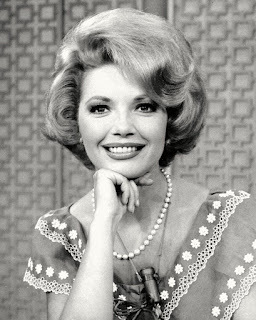 Laughton on the Senate's floor. 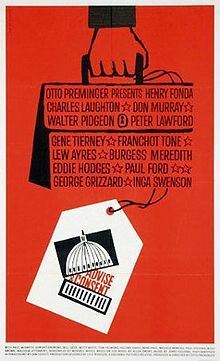 ﻿﻿The characters come alive courtesy of an exceptional cast: Laughton as the curmudgeonly senior senator from South Carolina; Pidgeon as the President’s right-hand man; Don Murray as a bright well-intentioned junior senator with his own secret; George Grizzard as an overly ambitious right-winger; Peter Lawford as a team player who finally sees through the hypocrisy; and Lew Ayres as an ignored vice president who may be stronger than people think. My favorite aspect of the film, though, is its “behind the scenes” look at Washington politics. A powerful senator, not selected for a subcommittee, pulls strings so he can influence a hearing as an “observer.” Strategists project votes to determine when they think they have enough to make their move. An ambitious junior senator campaigns to be selected as a committee chair. There are subtle threats of blackmail and not-so-subtle ones. Allen Drury, who wrote the Pulitzer Prize-winning bestseller on which the film was based, spent several years as a political reporter. His insider look is revealing and engrossing. I'm often surprised that director Otto Preminger is mentioned so rarely in conversations about great directors. It may have to do with his versatility. Many of the great filmmakers are associated with certain types of films, such as Hitchcock and suspense, Ford and Westerns, and Lubitsch and comedy. But Preminger, like Billy Wilder, could make a movie about anything: film noir (Laura); comedy (The Moon Is Blue); social drama (The Man With the Golden Arm); courtroom drama (Anatomy of a Murder); or suspense (Bunny Lake Is Missing). His direction is subtle and flawless in Advise & Consent, inconspicuously moving along the dialogue-driven plot. The 1960s were a banner decade for political dramas. The Best Man (1964), about two men seeking their party’s presidential nomination, is a fine companion piece to Advise & Consent (interestingly, it also shares a key subplot and also stars Henry Fonda). And though it’s more of a thriller, Seven Days in May (1964) provides a sharp portrait of a president facing a leadership crisis. All three films hold up amazingly well today and come highly recommended. Nice write up. I enjoy this film too, particularly Laughton, who has the southern accent down perfectly to my ear. American politics used to be fun. Powerful men making decisions. Now it's just who has the most money and avoiding decisions. Or purposely making the wrong decisions to benefit the few while running roughshod over most of the populace. Laughton, by the way, was sensational in this, as always. He got better and better as he got older, and he was great from the very get-go (his first movie was "The Old Dark House" from the director of "Frankenstein"). He was unspeakably splendid in "Spartacus" as well as "Witness for the Prosecution" with Dietrich. I like this film very much. I remember seeing it on the big screen and being shocked a bit by Don Murray's secret. But even then I realized that the way out afforded him in the book is NO way out. I was outraged, really. Charles Laughton is properly repellent and yet not without some sort of snakey charm. A really terrific film. I'm glad you had a chance to talk about it, Rick. THE BEST MAN is another winner. I agree. I watched it again last year and again got caught up in it. I've been meaning to write about it but was waiting to see it again. Shelly Berman is totally repellent in this one. Yikes! Worthwhile dramas that appeal to my inner anarchist. Politics is indeed a game. I really don't think the voter as an individual even figures slightly in their game. This one really holds up well, doesn't it? A few years ago, there were two Preminger biographies that came out about the same time and there seemed to be a a new appreciation for Otto Preminger. One of the authors, I think it was Foster Hirsch, said "Advise and Consent" was a worthy follow-up to "Anatomy of a Murder" as both seemed to examine the inner workings of how an institution operates. In Anatomy it was the law, in Advise politics. The one Preminger title I've seen recently that really blew me away was "Daisy Kenyon" one of the more adult 1940s melodramas I've seen. I was riveted from beginning to end. Rick, this is an outstanding film and a timely story. The cast and characters are very compelling. I especially found it interesting that Murray's character is quite judgmental given the secret he has hidden. Like you, I think Preminger is really underrated and profoundly diverse. Loved this film and your exceptional write up! 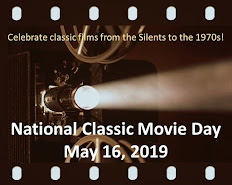 I saw this film many years ago on TV (Saturday Night at the Movies or some such show) and was blown away by the performances. I really need to see it again and actually had it in my hands at a local library a few weeks ago and ended up going with something else. I always enjoy watching Henry Fonda who I believe to be one of the finest actors of his time. He, of course, did play the President in FAIL SAFE, another political thriller from back in the sixties. As for Preminger, I think his stock has gone up in recent years. He took a terrible beating back in the 70's but then again with films like SKIDOO he probably deserved it. Over the life of his career he has made some excellent works. I am especially fond of ANATOMY OF A MURDER, WHERE THE SIDEWALK ENDS and ANGEL FACE. As I recall, Laughton was aces in this film (his final role). I particularly liked the ending and Lew Ayres' turnaround and the expression on Walter Pidgeon's face. Preminger was the rare director who liked to tackle topical-issue dramas (eg, EXODUS, HURRY SUNDOWN). There aren't directors like him anymore. How nice to see that ADVISE & CONSENT has other admirers! It's one of my top four Preminger films, ranking behind only ANATOMY OF A MURDER, the underrated BUNNY LAKE IS MISSING, and LAURA. (I must confess that I haven't seen DAISY KENYON...) This month, we plan to review THE BEST MAN at the Cafe (you know, I had forgotten that Fonda was actually in so little of ADVISE & CONSENT). Great post, Rick! Otto Preminger was, as toto said, underrated. I think he ranks up there with the best, like Hitchcock, Kurosawa or Bergman. I really like this film, and in addition to the movies Rick mentioned in the above comment, I also enjoy THE MAN WITH THE GOLDEN ARM. Rick, I have not seen this one, but I did see The Best Man (which was very good). You are right about Preminger often being overlooked, and I think you may be right about why. Versatility is not always a plus, maybe? Saw this one on a big screen a couple of years ago, having both seen it and read the novel by Allen Drury upon which it was based some years before, and it struck me as depicting a far more civilized situation than what we've had so far in the 21st century. From that standpoint, it's far more of a period piece than "The Best Man." Rick29 is quite right about the smaller size of Fonda's role in this film despite his top billing. He fared better in the movie I just mentioned as well as "Fail-Safe." By the way, he often said that he never would have made "Fail-Safe" had he known about "Dr. Strangelove." There's room for both, and I highly recommend Eugene Burdick and Harvey Wheeler's novel "Fail-Safe," which obviously used Jack Kennedy as the lead character, offering everything but his name. - Sen Fred Van Ackerman (George Grizzard's character) isn't a right-winger at all. He wants Leffingwell to get the Sec'y of State post (Leffingwell's opponents are all on the Right, including Dixiecrat Seab Cooley (Laughton)). No one remembers today, but Allen Drury,Advise And Consent's author, was an extreme conservative himself; this was reflected in the six novels that comprise the A&C series. Drury was incensed by what Otto Preminger did to his book in the filming. In Drury's version, Leffingwell is the villain - egotistical and duplicitous. Drury's hero is Orrin Knox, the Senate Minority leader (reduced to a small supporting role and played by Edward Andrews in the film). Although Drury doesn't name the parties in the books, it's clear that the Majority is supposed to be Democrats ('50s-'60s Stevenson Dems), while the Minority is the stable, reasonable Republicans (who are all but invisible in Preminger's movie, hence Drury's displeasure with the finished film). This would throw off more modern viewers of the film, who might roll their heads at the geography of the people here (making Grizzard 's character from Wyoming and Murray's Mormon from Utah Democrats definitely doesn't reflect reality today, but that's what they are in Drury's novels). - I guess what I'm trying to say here that Preminger's strategy was to de-ideologize the story as much as he could and concentrate on the human aspects of the characters. In my view, he succeeded (Allen Drury felt differently, to his dying day). I thought I had more here, but I guess not. Anyway, it's almost two years late, so what the hell.